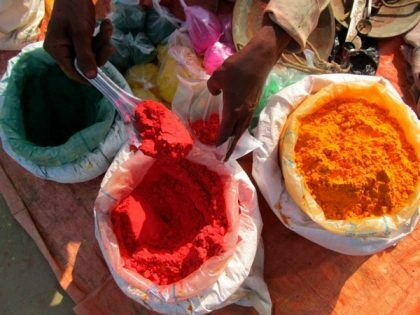 Once, little Krishna asked his mother Yashoda “O mother dear, why is Radha so fair and why am I so dark?” The mother laughed at the innocence of Krishna and said, “Go take this color and apply it on Radha’s face then she will also get colored like you.” And thus the festival of Holi came into being. 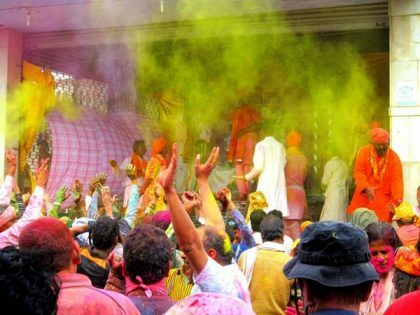 Holi, is the celestial festival of the love between Radha and Krishna and is celebrated among Hindus the world over with much fanfare and enthusiasm. 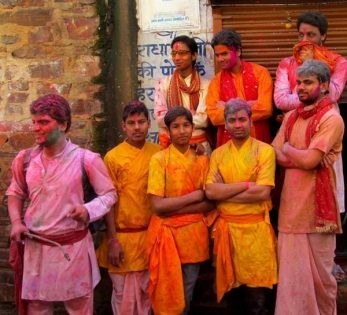 It is time to let your hair down and color every one around us in the same colours that Krishna once applied on Radha. On the first day of Holi (Holika dahan), farmers seek blessings from the Amighty for a good harvest year after year. On this day Prahlad, the child-devotee of Vishnu, gained a new life. It is also the celebration of the victory of good over evil. 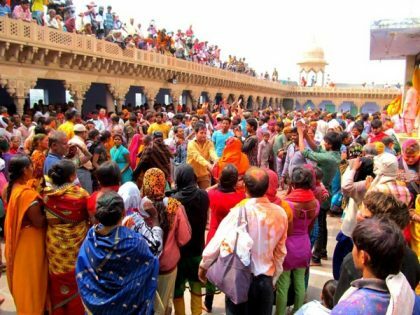 There is no better way to spend Holi in the land of Krishna and Radha known as Braj Bhumi, a conglomeration of 8 villages of Vrindavan, Barsana, Nandgaon,Mathura, Gokul, Govardhan, Daoji and Phalin. 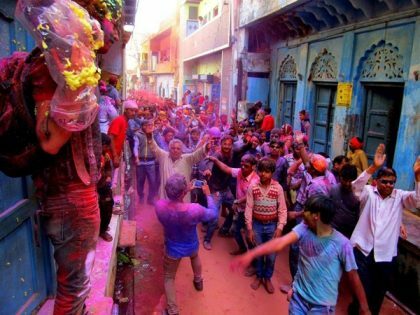 I happened to witness this divine festival in some of the villages, so come let me take you to this colorful journey. 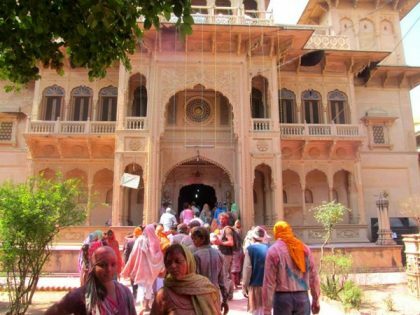 Just as you enter Barsana, Radha’s village you can buy lots of gulal and coloured turbans to wear for your parikrama of the temple. 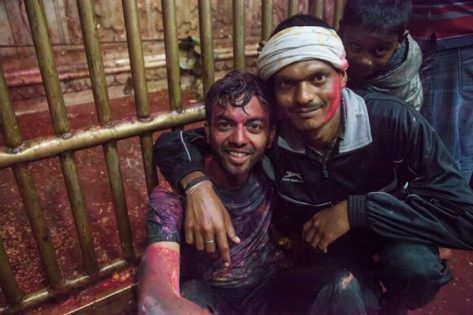 It’s a long journey to the temple filled with myriad colours and songs and bhajans with people throwing color on each other at every nook and corner. 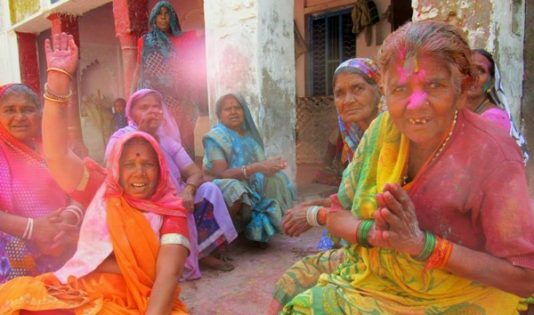 People ready to greet you on the parikrama route towards Radha’s mahal with colors and pichkaris. They are happy to get clicked as well. You can see the walls with Radha’s name almost everywhere. Coloured by standers in the Barsana village on the parikrama route. 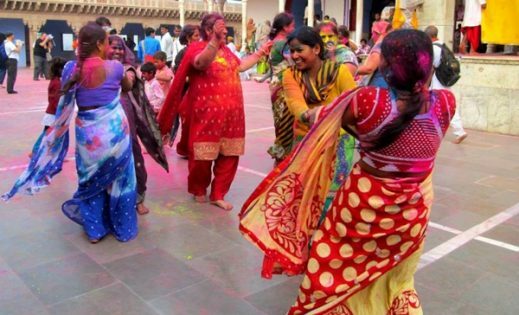 The atmosphere is exalting with people dancing in havelis, doing kirtans and Radha Krishna’s name in the air mixed with colors. A devotee is completely immersed in the atmosphere of his surroundings at parikrama route of Radha’s temple. 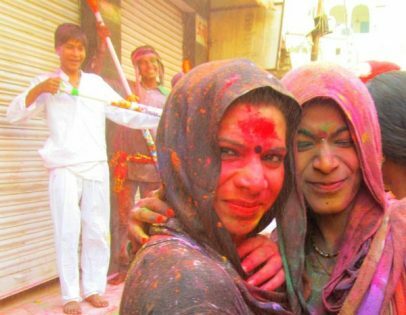 You get to meet a lot of ‘Sakhis’ (men who like to dress as women) who will greet you with Holi ki badhais in Barsana. 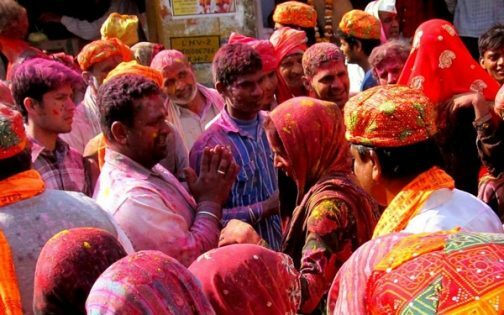 It is said everyone is Radha’s incarnation in Barsana and people from Nandgaon come to Radha’s village dressed as sakhis to invite them to play Holi with them. A stop over of people doing kirtan, dance, relaxing, enjoying the spiritual atmosphere enroute to Radha’s temple. 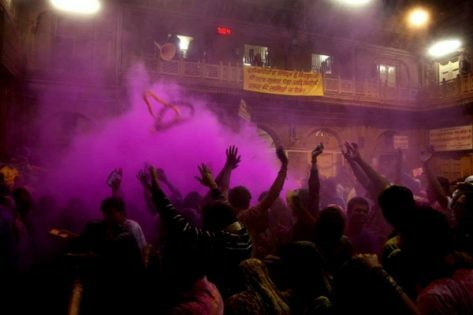 You can see the gulal in the air, men and women mix freely and dance to the loud bhajans of Radha and Krishna. Womenfolk greet you with Jai Shri Radhe and lot of gulal…you can see my camera screen has also specs of gulal. 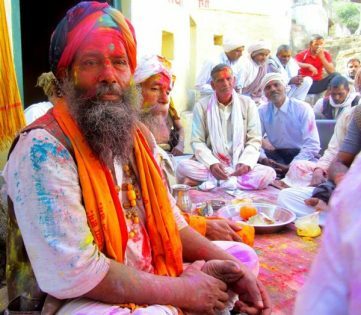 A Spiritual guru with color on his face with his mandli. 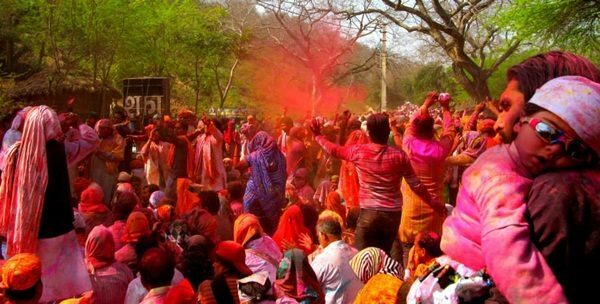 Crowds singing and dancing and rejoicing in Barsana gali on occasion of Holi. Just about to reach towards the temple entrance where Radha and Krishna reside. 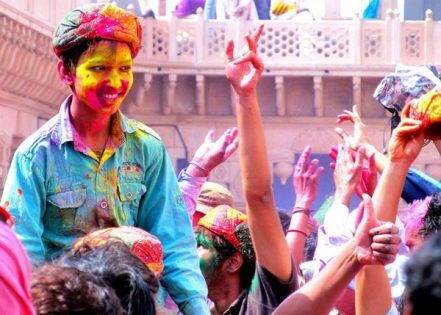 Youngsters rejoice with loud music, thandai to the tunes of Radha Krishna bhajans. 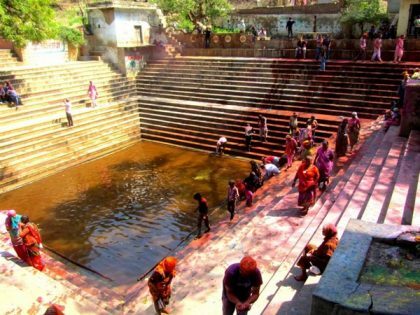 Kund near the Radha mahal where devotees take a dip. Women drenched in gulal sit and take stock of the situation near the temple. 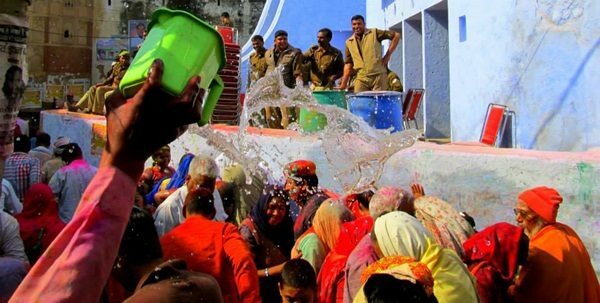 Splash goes the water filled pitcher on people on the parikrama route as police men watch over. You can also apply gulal to women you don’t know and say Namaste. No one seems to mind it. The entrance to Grand mahal of Radha. The temple is beautiful and inside you can find Radha and Krishna in their most beautiful form playing Holi with their bhaktas throughout the day. 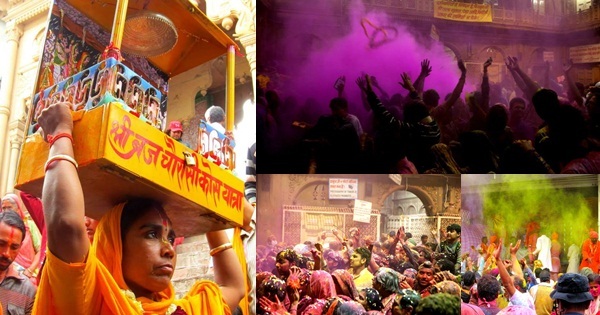 We now take our journey to Nandgaon where Nandbaba and Yashoda play Holi with Radha, Krishna and Balram. 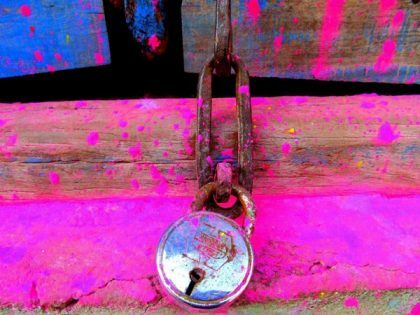 A lock on the gulal covered door in Nandgaon. As preparations are beginning for Krishna and Balram to come out womenfolk dance the traditional kikli dance. 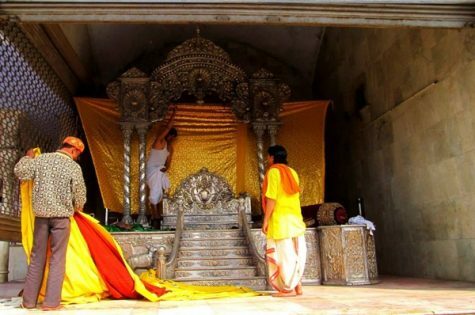 Priests preparing the jhoola for Krishna and Balram from where they will give darshan to devotees. A boy coloured in gulal sits on his father’s shoulders in Nandbaba temple enjoying the festival. Finally lord appears with the chants of Jai Shri Krishna, Shri Radhe and gulal goes up in the air. Festivity at its peak in the Nandbaba temple. Temple priests sit in line. 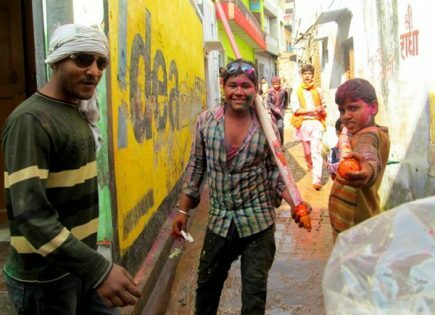 Giving color to people. 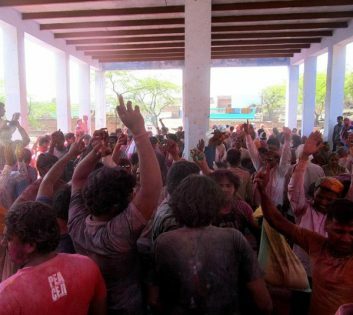 As soon as Krishna and Balram step out of their house, the devotees rejoice and spread gulal in the air chanting Vrindavan Bihari Lal ki jai! 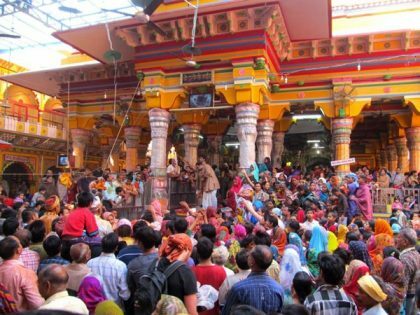 Several devotees do the entire Braj Bhoomi yatra which is around 84 kM or 252 kms covering all 8 villages associated with Krishna, Radha and Balram with their personal temple on top of their head, they only take rest to eat in small gaps. She had come to take darshan of Nandbaba temple. 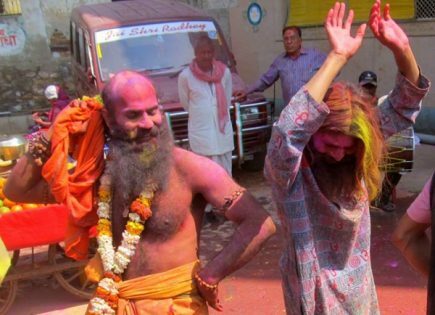 Some foreigners inside the Nandbaba temple enjoying the Holi festival. 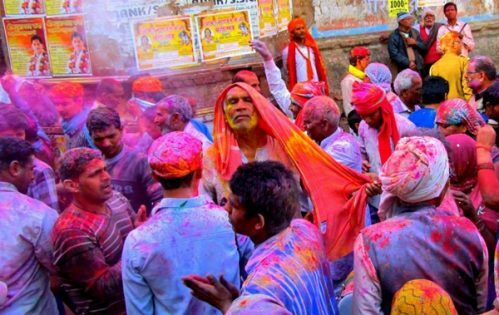 People from all over the world come over to witness this colorful spectacle. 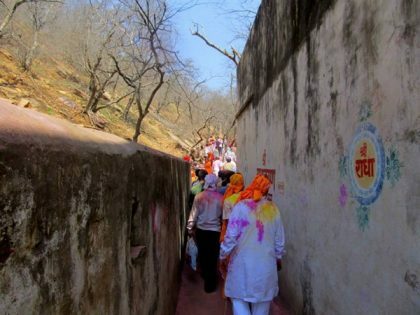 As you come down from the Nandbaba temple you greet hundreds of people waiting for Lathmar Holi. 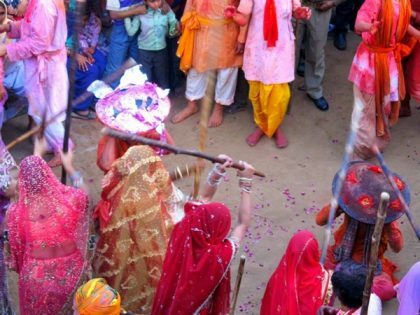 Women from all households dressed in their bridal finery gather in the open area and wait for men to line up. Once the instructions are given men sit down with their protective shields over their head and womenfolk use all their force to beat them with long solid wooden sticks. It is a spectacle to witness. 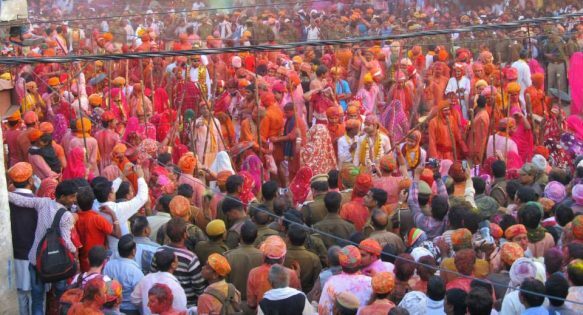 Another scene from the middle of the ground where the Lathmar Holi takes place. The whole area from the terrace. 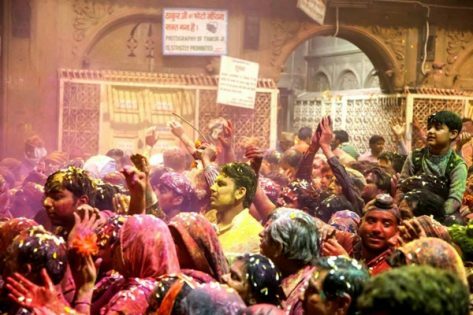 After coming from Barsana and witnessing the world famous Lathmar Holi, we came to witness the Holi at Shrinath ji temple at Mathura. 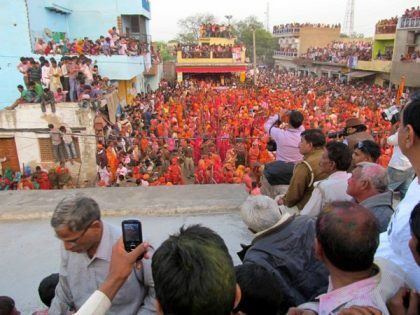 Another picture from the Mathura shrinth ji temple. 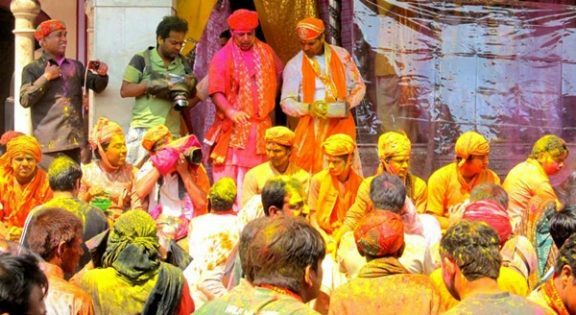 Devotees drenched in colors and flower petals give their salutations to Banke Bihari Ji at Banke Bihari temple Vrindavan. 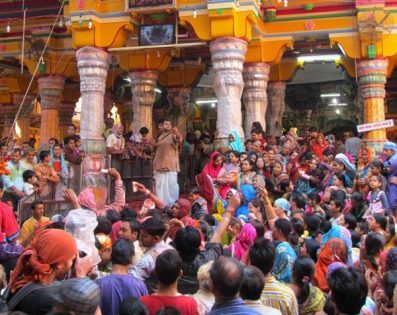 At Banke Bihari Temple with another devotee, you can see the ankle deep colored water. 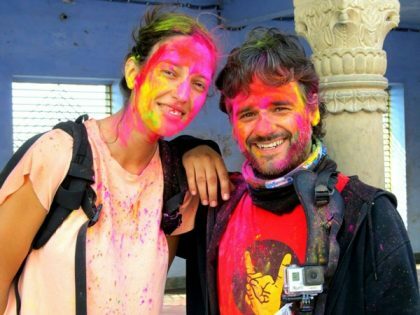 Our 8 day journey to Braj Bhumi culminated as one of the most colorful times of my life. 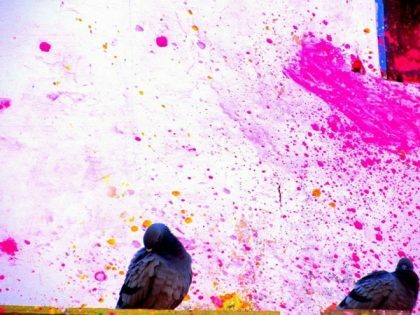 Wishing a very happy Holi to each one of you! 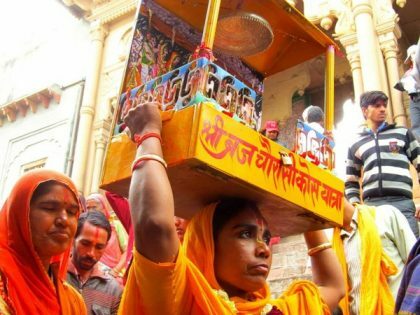 Jai Shri Radha Krishna! Anubhav Gupta is Founder Director of Jeevan Trust (an NGO dedicated to the cause of albinism) and a blogger.